Ten+ Years of Service to the Community! 1/11/18, - MANOFA (Malayalee Association of North East FL) took toys for the children in the Hastings community AND brought a meal for the families. This group works very hard to support all members of our community, and on behalf of the families in Hastings, THANK YOU! With the help of Bobbie Terry with Shepherd's Haven, St. Johns CARES offered guidance to the project. Just look at the happy faces! 12/18/17 - VyStar Credit Union, led by Brian Corson, VP of the 210W branch, and the Hilts family and friends come through at the last minute to provide the December holiday dinners in Hastings and Armstrong! Teamwork makes the dream work and these wonderful volunteers prove it!! 12/11/2017 - Community Generosity Marks the Eleventh Annual St. Johns CARES Giving Tree! This year's Giving Tree was able to raise approximately $40,000 in donations for 40 in-county charities' wish lists of items necessary to continue their good work. Many thanks to our generous donors, business and organizational supporters and sponsors, and adult and teen volunteers. Click the photo below to see a slideshow of some of those charities receiving your generous support. 11/23/2017 - Second Annual St. Johns CARES Kids Turkey Trot a Blazing Success! Despite a soggy morning over 100 contestants raced or strolled their way to the finish line. A parade entertained spectators and contestants after the 5 and 10-K races were finished. Over $2,000 was raised to benefit St. Johns CARES 2017 Giving Tree. Thanks to Psych Ed Connections for hosting the race and to our sponsors and supporters, including Fun4FirstCoastKids.com, CrosswaterConnect.com, Bright Smiles Dentistry, Trader Joe's, and other local businesses. Click the photo below to play the slideshow. 9/17/2017 - Never Forget, St. Johns CARES Kids and First Responder Appreciation. SJCKids visited Fire Station 18 in Nocatee to learn about first responders' role in 9/11 and to show their gratitude to their own first responders. They brought dinner for the three shifts of firefighters and paramedics and the children colored a banner to celebrate their local heroes. Click here for the story in the Ponte Vedra Newsline and click the first photo below to play the slideshow. ​8/12/2017 - Chef's Night Out at St. Francis House courtesy of St. Johns CARES Kids. SJCKids served up a delicious meal at the St. Francis House Shelter and gave the kitchen volunteers a welcome night off. Click the photo below to see play-by-play pictures. 7/17/2017 - Thanks to Robyn Gay Friends and Family for providing a meal to the farm workers in Armstrong. Great food and great service! A big thank you to Publix store #1084 at Plantation Plaza for providing 2 1/2 pallets of food going to Christ's Cupboard and St. Francis House. Volunteers from Celebration Lutheran Church and St. Frances House loaded three trucks worth of badly needed non-perishables while St. Johns CARES president, Meg Balke told Publix Manager, Robert Anchors, and Assistant Manager, Jason Hancock, about the urgent need for nourishing food for the less fortunate in St. Johns County. The food drive is part of Publix' twice a year corporate Food For Sharing campaign. See the August 2017 Creekline/St. Johns Newsline article in the News Archive. The next drive will be in November. 6/4/2017 - First Ever Kids ​Farmer's Market was a Success​! An estimated 180 people came out to shop from 15 different local kid vendors and to play carnival games at the first ever Kids Farmer's Market hosted by St. Johns CARES and Helping Hands of Nocatee. Almost $700 was raised in support of local charities including Sound Connections Music Therapy for Children with Special Needs, which services 100 children across the county. Click the image below to play the slideshow (photos by Katrine Strickland and Jill D'Amato. And see our Facebook post! 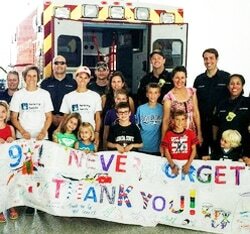 9/11/2016 - 9/11 Never Forget Banner and Dinner Delivery to Nocatee Fire Station was a huge success! Thank you to all of the volunteers who helped show our local First Responders how much they are appreciated! Click the image below to play the slideshow. St. Augustine Humane Society Surgical Tour was a great success! Look for pictures soon! We are very proud of our volunteers! It's a great feeling to know you have made a difference in your community. We invite you to make a difference with us. See our Volunteer Calendar page, come to a meeting, or contact us. We are "Uniting the Community Through Helping Others in Need."